If your pet bird begs for a bite of your slaw, you might be inclined to share. the fact is, most vegetables are good for birds. While Frieda will nosh on anything you're eating, not all veggies are appropriate to feed to her. Cabbage is one to avoid. You won't see cabbage on a list of vegetables recommended as good for your pet bird. Avian veterinarian Crystal Shropshire explains that is because cabbage doesn't provide nutritional value that your bird specifically needs, therefore you should feed the bird better, more nutritious veggies. 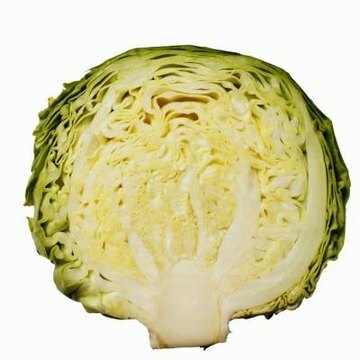 Cabbage may be discouraged because it contains oxalic acid, a naturally occurring substance that can keep birds from properly absorbing calcium. Cabbage isn't the only vegetable that has oxalic acid. Spinach, parsley and chard are other green leafies that have it, too --- though they're also sources of vitamin A and other nutrients. If you feed Frieda cabbage or other leafy vegetables, be sure her diet includes foods abundant in calcium, like carrots and almonds. Give your bird the calcium-loaded foods in different feedings from the leafy greens to improve her ability to utilize the calcium. Cabbage is just one vegetable out of a whole garden full, so you'll still have plenty to choose from if you opt not to feed it to Freida. In the book "Parrots for Dummies," Nikki Moustaki lists more than 30 fresh vegetables that are good and tasty choices for pet birds. Moustaki's list includes yams, broccoli, celery, cauliflower, brussels sprouts, peas, carrots and corn. Although cabbage isn't on Moustaki's list, a handful -- broccoli, cauliflower and brussels sprouts -- are cruciferous veggies that come from the same family as cabbage. Cooking cabbage won't reduce the effect it has on calcium absorption, nor will it increase the nutritional value to your pet bird. However, domesticated birds do not like dietary variety; you might find yours prefers some veggies cooked and others raw. Steamed, fresh or raw vegetables should constitute about half of a bird's diet diet to provide her with a natural source of vitamins and minerals.